This what Terenzio has to say about his lines. These lines are much thinner that the corresponding line in PVC and this helps to cast into the wind. They have been conceived to be accompanied during casting and not forced. My lines are long lasting (they last years – up to 20), supple and they float excellently and they do not need to be dressed every time to get good flotation because thanks to they way they are made and to the materials they float very well. They float better than some of the modern lines. Even I happen to go fishing without dressing the line and I must admit that I do not note much difference. These lines do not break the surface film but they bend it and float on it silently and without splashing. As I said, my lines need a short running in period, in fact once the thin layer of dressing has worn off you are rewarded buy great floatability and suppleness; the external braid protects the internal line dressing which is the part that floats. My lines are like good wines, they get better with age which is the opposite to what happens with PVC lines which deteriorate with age. Another characteristic is the profile of the parallel part of the line, this is perfectly round and should never be flat. Another characteristic and many have told me, is that if you forget a wet line on the reel, no mildew grows on it. They are all double tapered (D.T.) and classified according to the A.F.T.M.A..
You can have various kinds of weight and the silk lines are available in 00 – 0 – 1 – 1½ – 2 – 2 ½ – 3 – 3 ½ – 4 – 4 ½ – 5 – 5 ½ – 6 – 7 – 8 – 9 – 10 – 11 , the artificial ones in 2 – 2 ½ – 3 – 3 ½ – 4 – 4 ½ – 5 – 5 ½ – 6 – 7 – 8 – 9 – 10 – 11. My lines are standard lengths and up to a 7 weight they are 25 metres long and these are ideal for normal fishing. 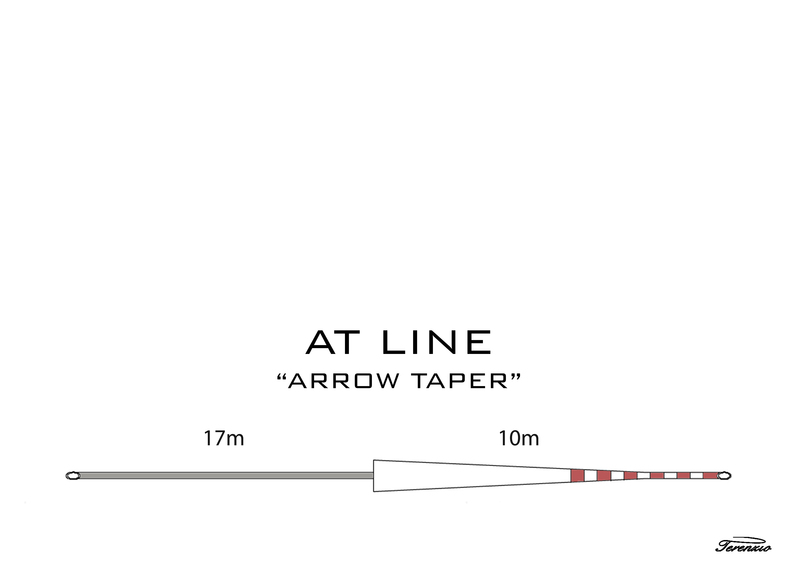 The heavier weight lines go up to 35 metres and are ideal for salmon fishing. I’ve been using Terenzio pure silk fly line with my cane rods for some time, when Terenzio contacted me and said he had added two new line to his line up I was quite excited to try them on my more modern rods. Terenzio has just emailed me to say there are some demo lines on their way from Italy so in the next week I should be able to have a play and report back. This is what Terenzio has told me about his new lines. 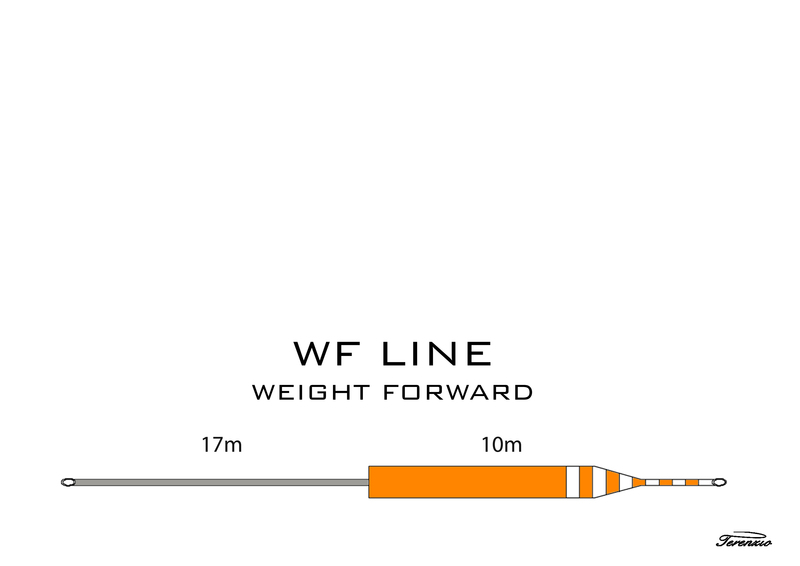 the WF line (weight forward): this is a decentralized line. This is a technique lines that allows the angler to reach substantial distances. This is suitable for casts with heavier flies. This line is long 27 m and is colored like the profile attached. This line facilitates the fishing in the presence of wind, in fact it’s structure with the weight shifted forward it can cut and fight the wind. Their lard allows them to have very fast casts. A line is also suitable for fishing in the lake (considering its adaptability to the distance). shooting to pose slow and slight. This AT line has a very long taper that allows you to have a pose delicate. Particularly suitable for large rivers and long casts. This is also about 27 m long and the colors used are those that are within the profile attached. Now I’ll do something for you that I will send you as soon as possible to show your clients. Meanwhile, of course, if you’ll need more information to find me here.